Solar heating systems are generally composed of solar thermal collectors, a fluid system to move the heat from the collector to its point of usage. The system may use electricity for pumping the fluid, and have a reservoir or tank for heat storage and subsequent use. On average, a solar water heater will reduce your water heating bills by 50% - 80%. Because the sun is free, you're also protected from future fuel shortages and price hikes. • Anticipated payback period of 3 to 7 years, in years with state and federal incentives. • Solar energy systems can take advantage of the sun's free energy year round. • Solar energy can be produced even at low temperatures. • Federal tax credits help pay 30% of the system and installations costs. Many states and utilities offer additional support. • Between tax credits and energy savings, this system offers a faster return on your investment than other types of solar energy systems. • Solar energy is an unlimited resource. • Solar energy does not produce harmful emissions or require transportation or pipelines like electric energy does. • Solar water heating systems installed in the U.S. help reduce our household energy consumption, and the nation's reliance on toxic fossil fuels. • Solar water heating systems will work anywhere in the U.S., not just sunny states. • How many panels will it take to provide my family with hot water and what do the panels look like? On a typical single-family residence, there will typically be one or two solar collector panels on the roof. The panels resemble skylights, and will be about 4 feet wide and 8 to 10 feet long. • How much hot water does a typical family use? Hot water usage in the U.S. is typically 15 to 30 gallons (55-110 l) per person per day for home use. This generally includes bathing, clothes washing, and dishwashing. But your commitment to efficiency has a lot to do with your actual usage. • Do you need to install a hot water tank? What size would be needed? • What about in the winter when it freezes? In some areas, solar water heating systems may require some measure of freeze protection. Although there are many types of systems in use today, drain-back and closed loop systems with antifreeze and heat exchangers are the best choice for freezing locations. The extra parts increase cost and reduce efficiency, but since one frozen moment can turn into a disaster, it's worth the cost. You will find that there is little, if anything, for you to do once we have started your system and checked its operation for the first time. 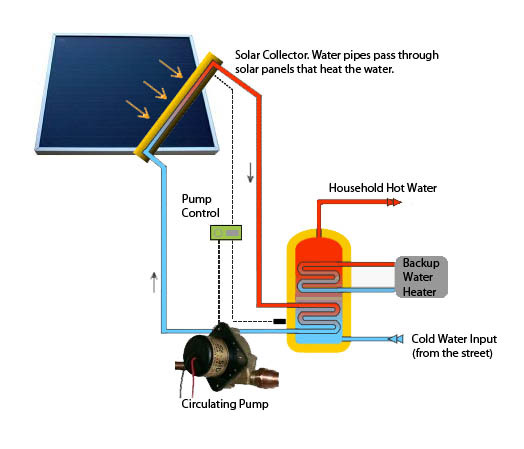 Properly designed solar water heaters are completely automatic and are left in operation year-round. Active systems have a small electronic control with one or more indicator lights to let you know if there is a malfunction. Call today to schedule a free site evaluation to see if a solar hot water system can benefit you.